The next Swine & Dine dinner is taking place on March 15, 2018 at the Royal Glenora Club. Tickets to the 4-course meal are $75. Buco’s new Windermere location at 12249 Windermere Way SW is now open, while the long-awaited branch in the Epcor Tower will open in mid-March. Back in January, Explore India joined Filistix as a food truck-turned kiosk at MacEwan. The historic Gibbard Block in Highlands has been sold and will be renovated this spring – La Boheme is shutting down as of March 18, 2018. 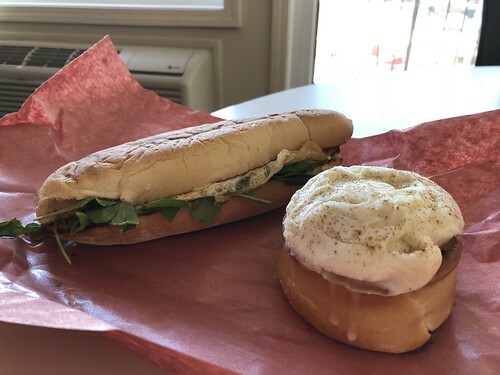 Liane has a run down of the fare available at the newest breakfast and lunch joint in Old Strathcona, Rooster Cafe. Speaking of brunch, Liane has more details about what to expect of OEB’s first Edmonton location (and details of a second location in North 53’s current space). The Journal reviews the fare at the Passport, the sister bar adjacent to Cosmos on 124 Street. Ms. Hangry Foodie found a very affordable afternoon tea option at Reinette Cafe. Twyla has the latest review of Mayday Dogs. Andrea found a new favourite in Pip’s brunch. Vue Weekly enjoyed their visit to Bodega Highlands. Graham finds consistency but not creativity at Cibo Bistro. Avenue Magazine is collecting suggestions for the best pizza spots in the city. Remedy has plans to expand to Calgary and Tofino in 2020. The Toronto Star rolled up 8 places they visited while in Edmonton. Liane shares the love story of Holy Roller Chefs Rafael D’Alcazar and Ariadna Uribe. Sharon tried the caramel and cornflake snacks offered by new local vendor Caramunchies (created by one of the founders behind Caramia Caramels). CBC Edmonton has been inviting local chefs to their “tiny kitchen” to cook easy-to-replicate recipes – check out their first four episodes with Red Ox Inn’s Sean O’Connor, Baijiu’s Lex Boldireff, Canteen’s Ryan O’Connor and Cafe Linnea’s Kelsey Johnson. It was promising to hear that Edmonton area mayors voted in favour of exploring how they might preserve agricultural land in the region. If Doritos had announced their “lady friendly chips” on April Fool’s Day, I wouldn’t have thought anything of it. I’ve been slowly re-integrating foods that were off-limits to me in pregnancy. Last week, this included a deliciously runny egg in Farrow’s incomparable Grick Middle sandwich. The cinnamon bun was a bonus I couldn’t pass up.